I'm glad that GRISD is doing the right thing. 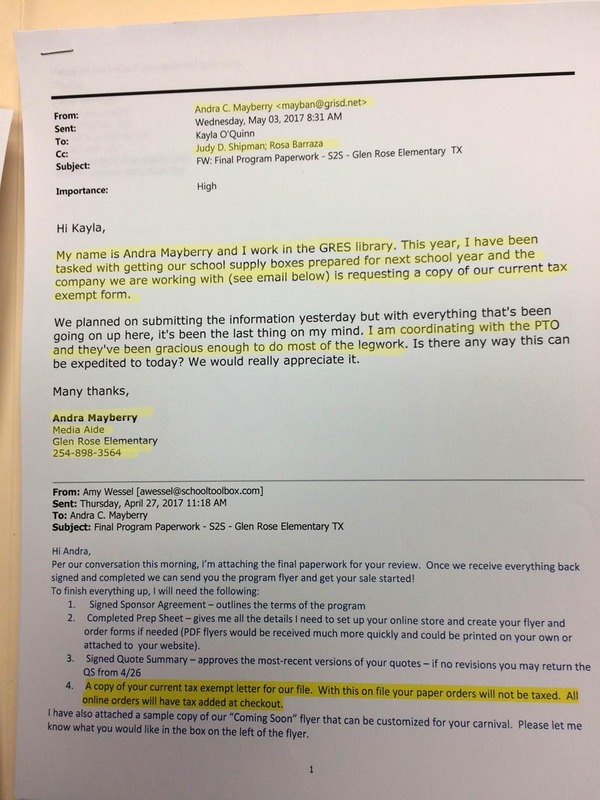 Still believe that there should be a stricter, more defined relationship between GRISD and Glen Rose PTO (which filing on the SOS is entirely outdated). 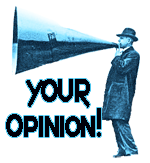 Should PTO be using official GRISD email? Should they be using their physical street address? 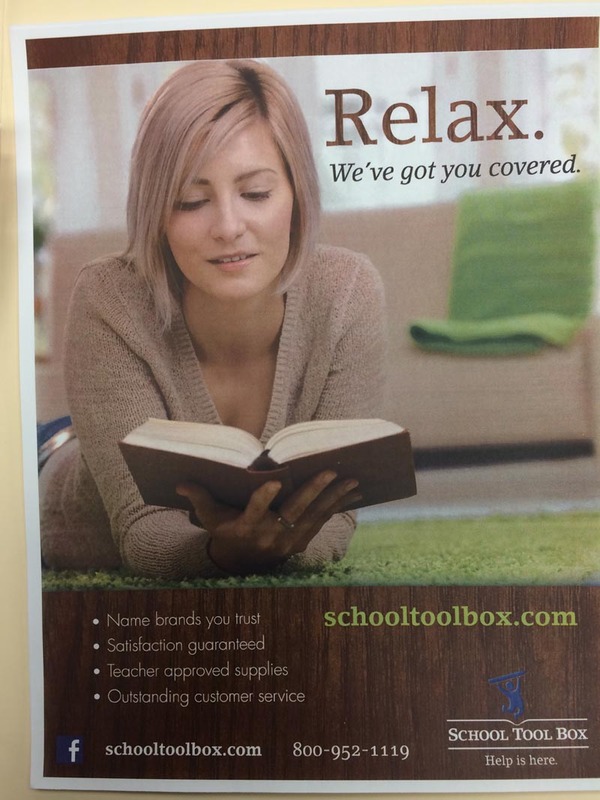 What type of process is in place for those who wish to use the school as a mailing address? 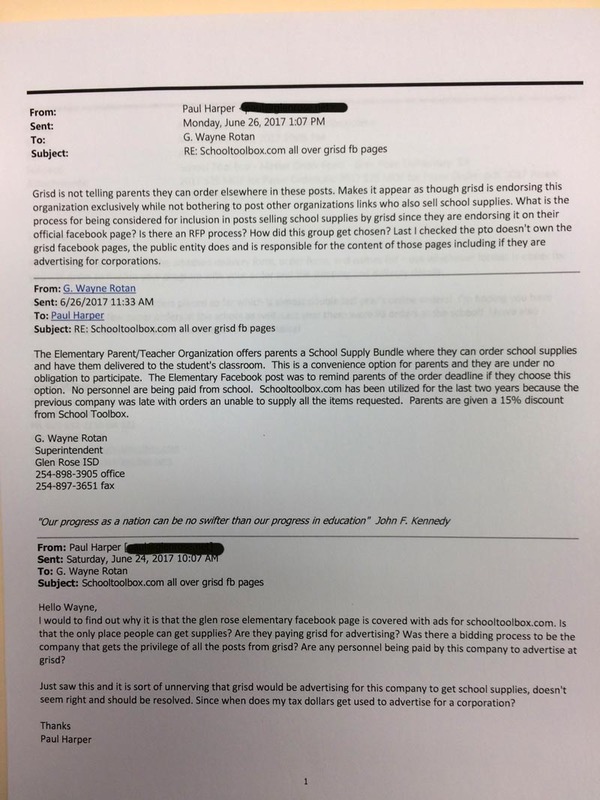 Should the PTO be able to freely access and post advertising materials of any sort ot the official school page, particularly when there is no evidence that it is the PTO doing so and not GRISD? 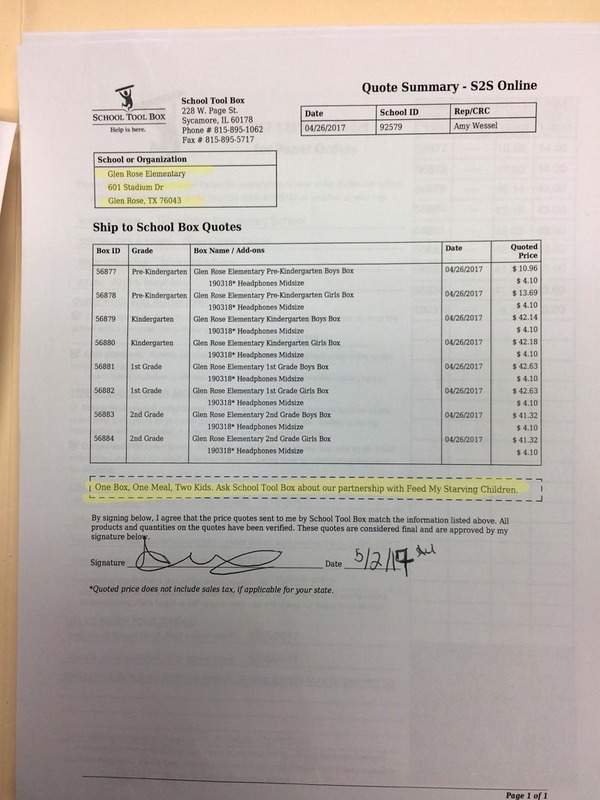 And finally, especially since the PTO is a tax -exempt entity, shouldn't they,be more scrupulous about following IRS rules and shouldn't GRISD be more particular about who and how public resources, or official resources connected with the school be used? 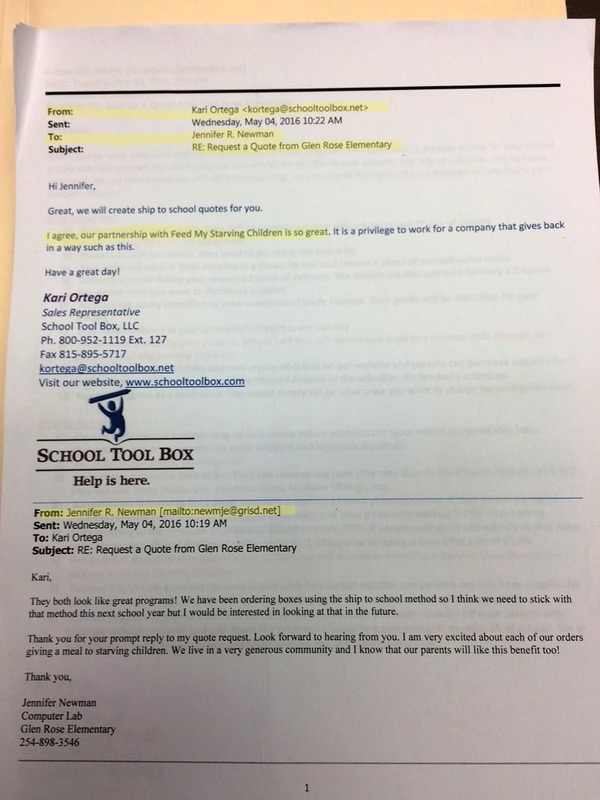 Wrote about this before I did an open records request to ask records from GRISD regarding schooltoolbox. 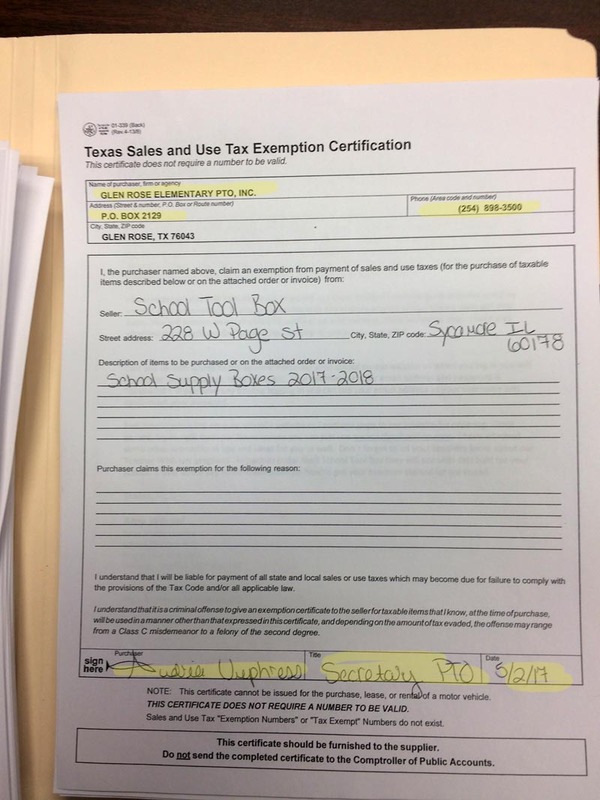 My questions to be answered had to do with whether Glen Rose ISD was endorsing a company that supports a religious purpose.I have an issue with a public school district supported by tax dollars sending any money to a mission. 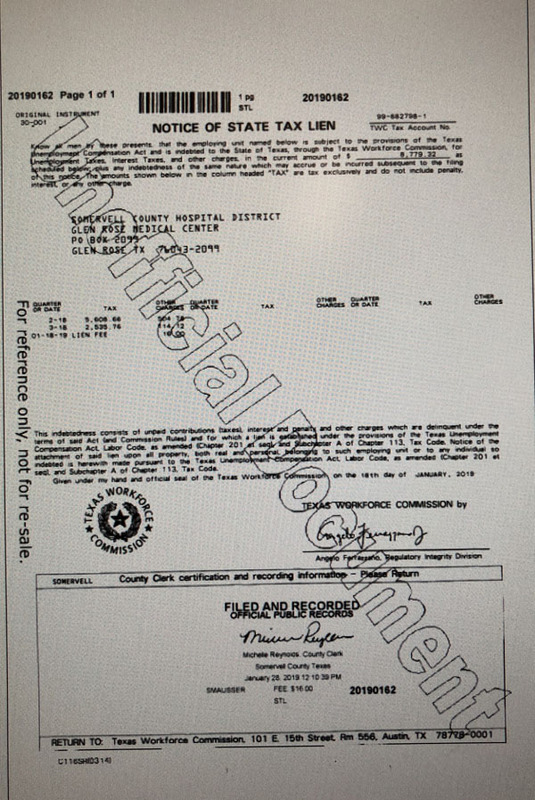 The facts, as you will see below, are that two different people that aren't necessarily even associated with the Glen Rose PTO were doing ordering through this company, using grisd email, addresses and phone numbers for billing, and advertising for it on the official Glen Rose Elementary School Facebook page, with the knowledge of principal Debra Morris, as well as Wayne Rotan, superintendent. 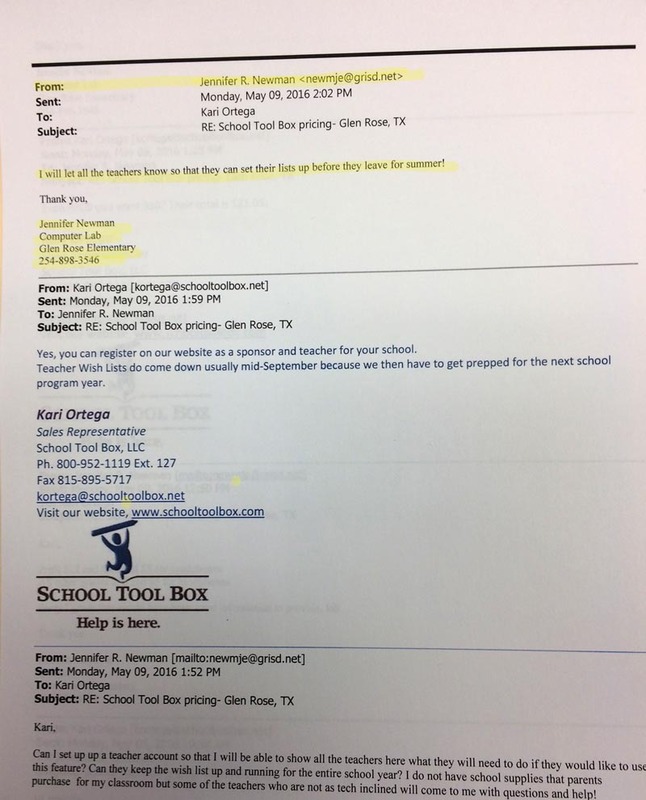 Further, the PTO as registered on the Texas Secretary of State website uses also the GRISD address rather than one for what I always thought was supposed to be an adjunct, private organization acting as a booster TO the school. 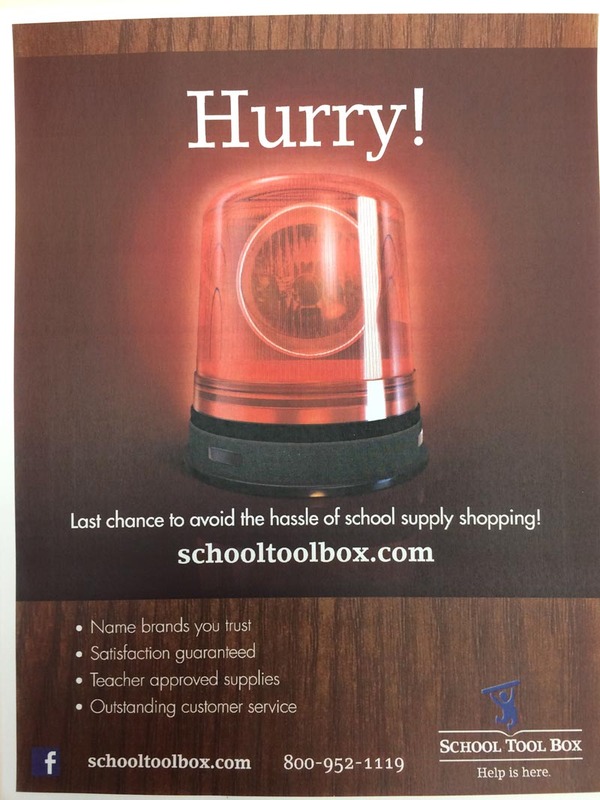 To start, it appears that the Glen Rose ISD is the one actually pushing using SchoolToolBox, including pressuring families to buy from that company via a nag from an official Glen Rose ISD page, the Glen Rose Elementary School page on Facebook. How? 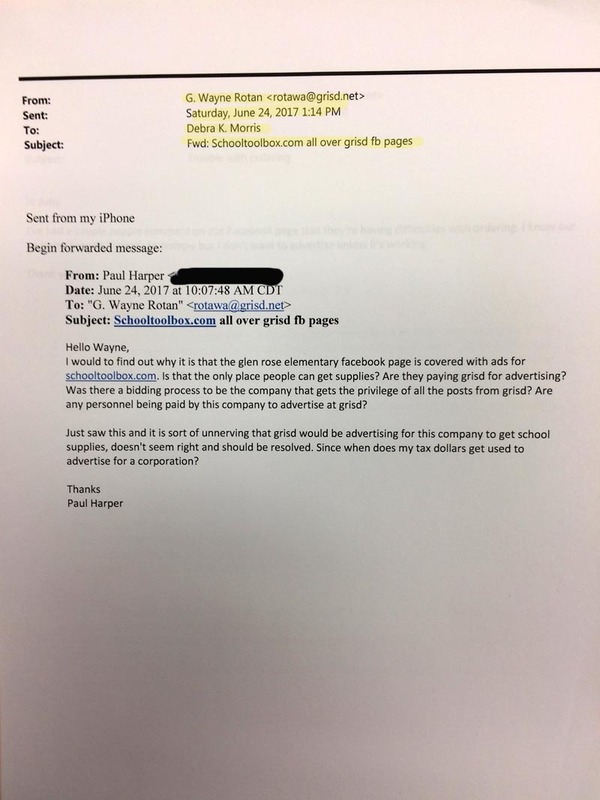 By having the people who work FOR GRISD use GRISD email in their communications with this company. 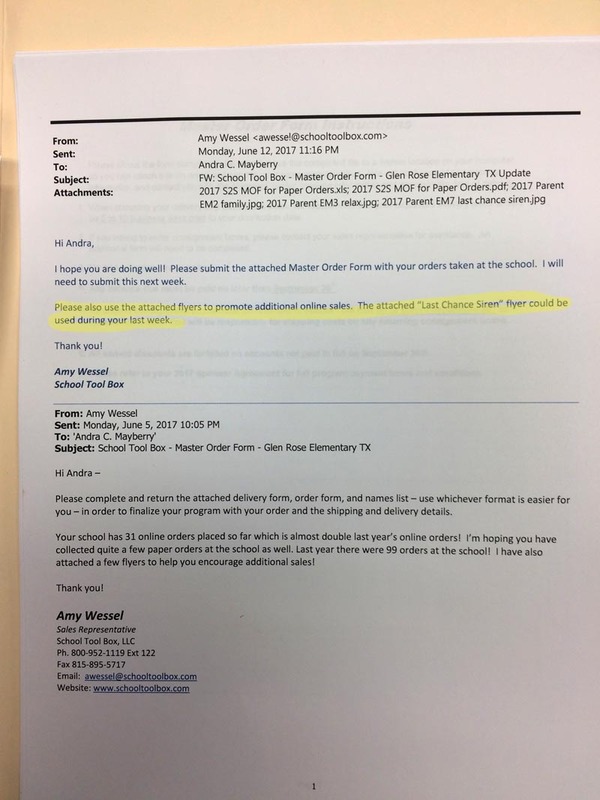 The subject on this email is "Request a Quote from Glen Rose Elementary"... NOT Glen Rose PTO. 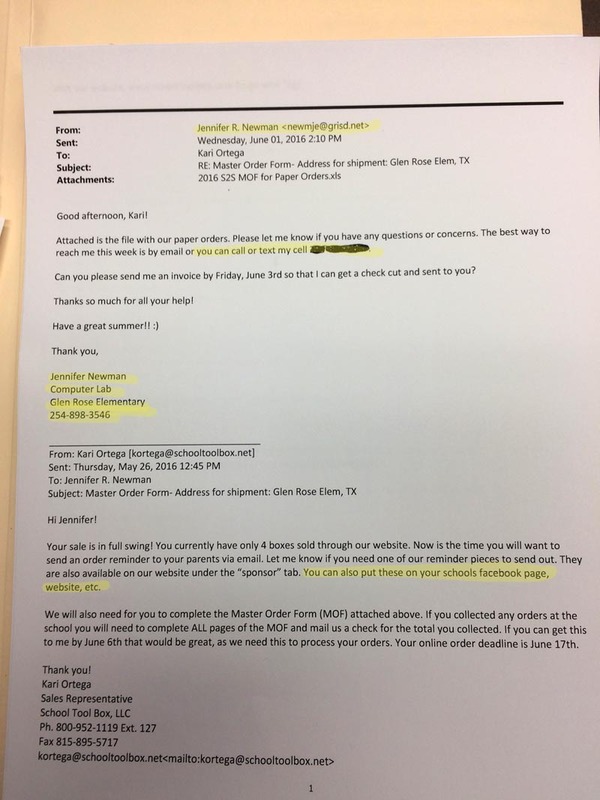 The email went to Jennifer R Newman with a grisd.net name. 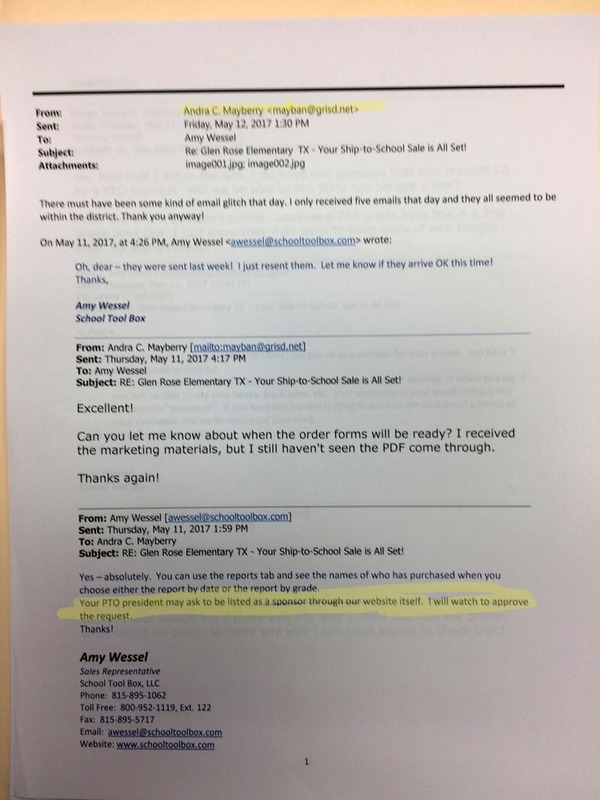 Apparently Jennifer Newman soliticed information from SchoolToolbox.net because the day before the same rep emailed details about the program. 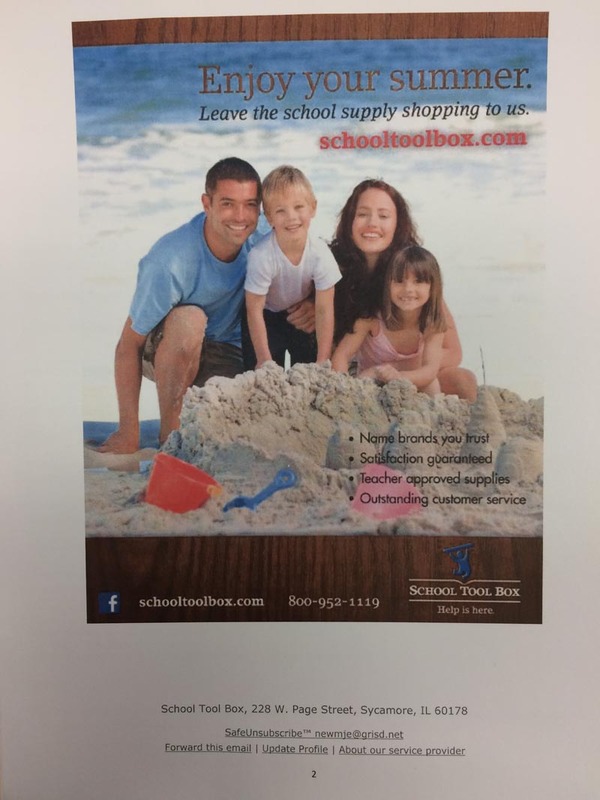 Noe that it clearly says "For all orders placed by your parents, School Tool Box will donate one meal to a starving child through our partner, Feed My Starving Children"
Including an order form, which show SchoolToolBox donates to Feed My Starving Children. 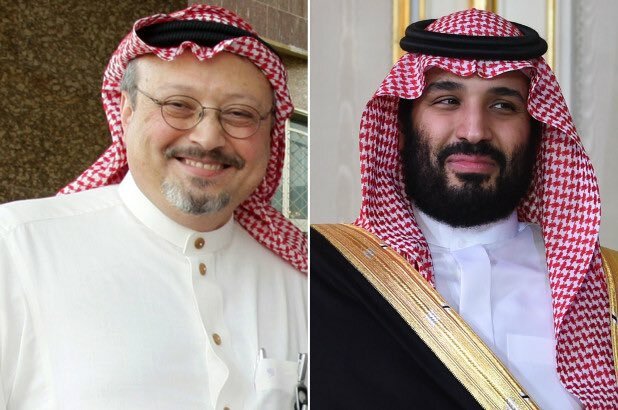 Read my original post, linked at the top, for why supporting a religous mission is not only inappropriate but likely illegal, and also information regarding Feed My Starving Children, as well as the company SchoolToolBox.com itself. 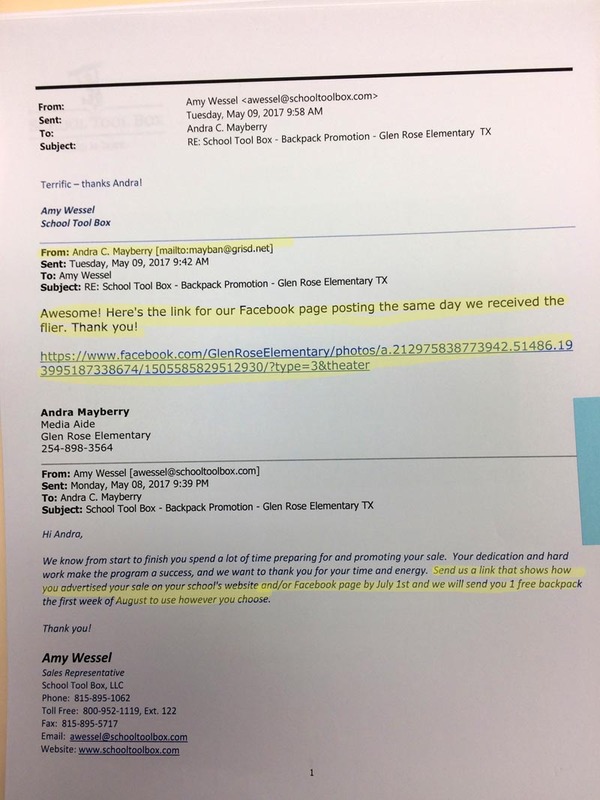 Note that, besides using GRISD email address, Jennifer Newman uses her position in the Computer Lab at Glen Rose Elementary with the school phone number. The PTO is apparently not driving this effort, but rather the school. 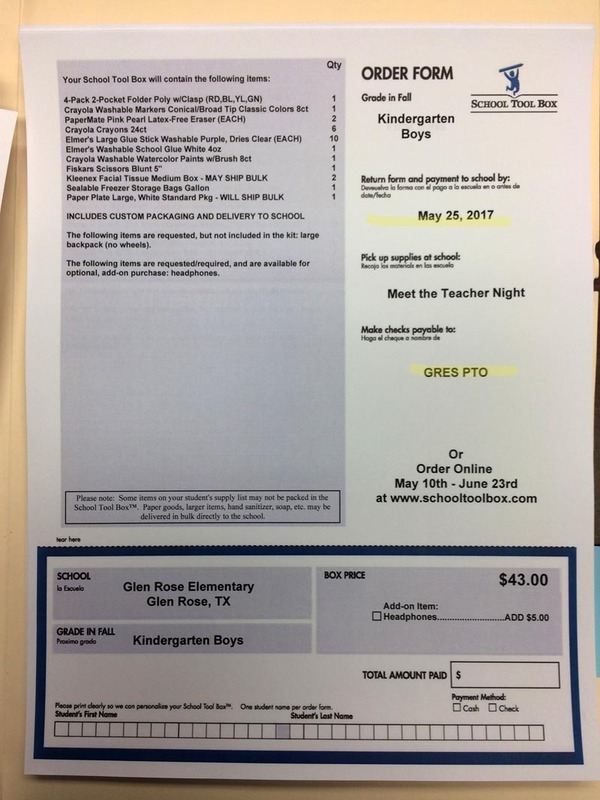 Howver, the Glen Rose Elementary PTO is the "Bill To", using the school's address. 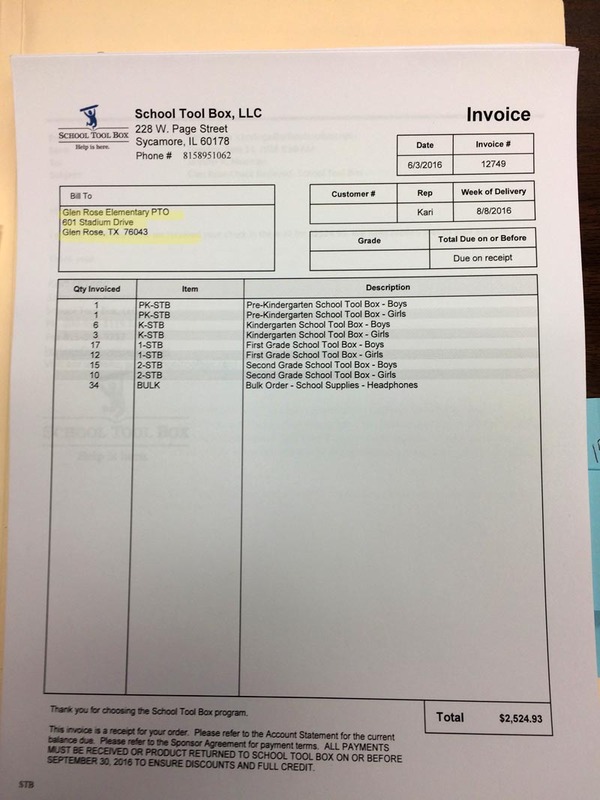 Under what circumstances does GRISD allow a PTO use a public school as billing? Delivery to the school is a different matter. The rep suggests that FB be used for advertising. That was the 2016 school year. Now to 2017. 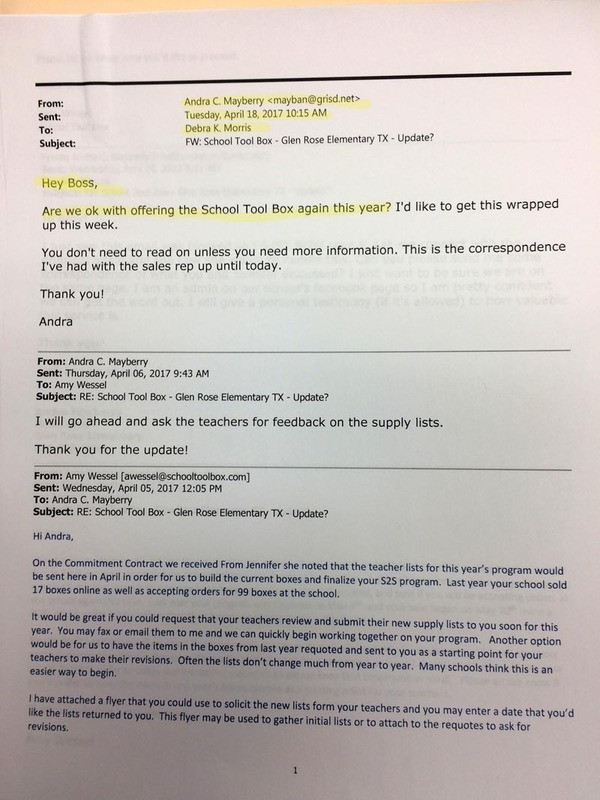 On April 18, 2017, Andra C Mayberry, also using a grisd.net email address, sends to principal Debra K Morris to ask "Are we okay with offering the School Tool Box again this year?" Andra is (or at least was in 2017) an admin on the school's Facebook page as well as Media Aide for Glen Rose Elementary. It's unclear on the following email that the PTO is involved. 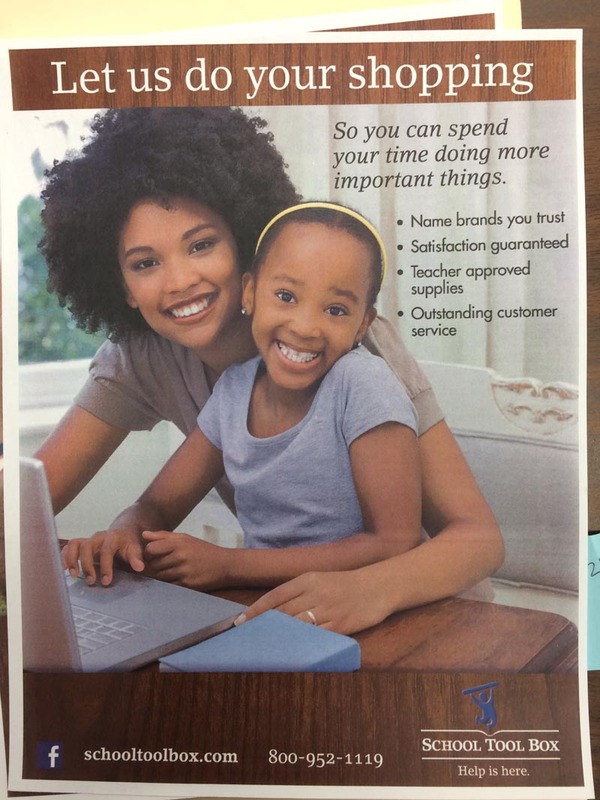 Andra sending out flyers to parents, again, GRISD. 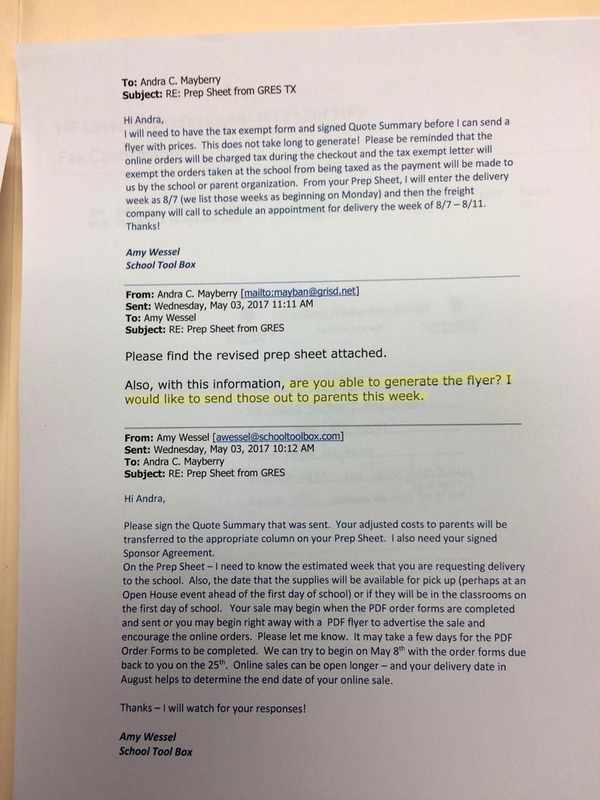 The order form quote from 5/2/2017 shows the relationship with Feed My Starving Children. Here's the actual order which has the check going to the PTO. That's entirely appropriate. 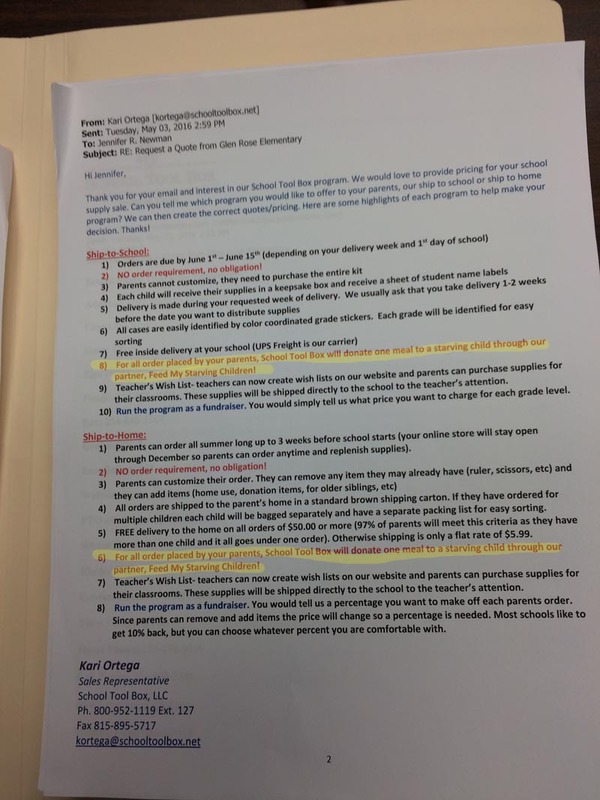 What is not is that the PTO is not the one generating this order but rather Andra under the auspices of a public school. 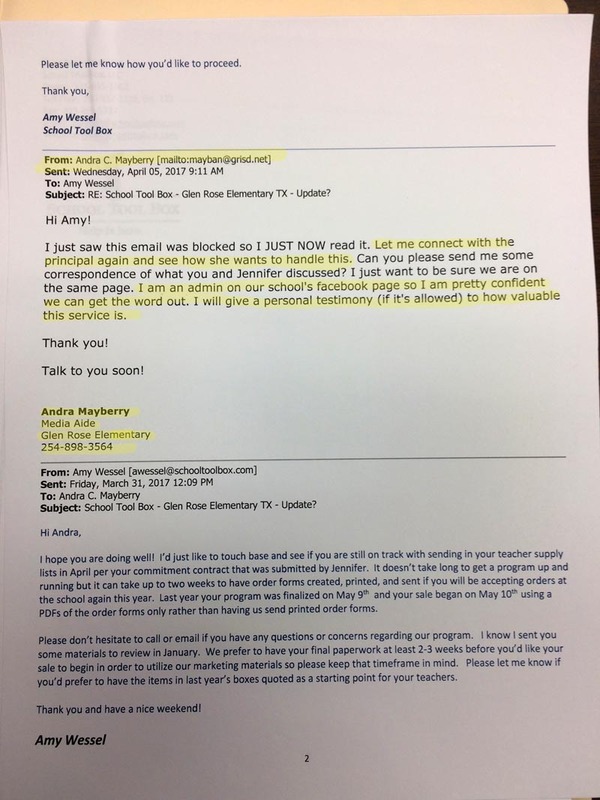 Rep again encourages Andra to put a link on the official school FB page. 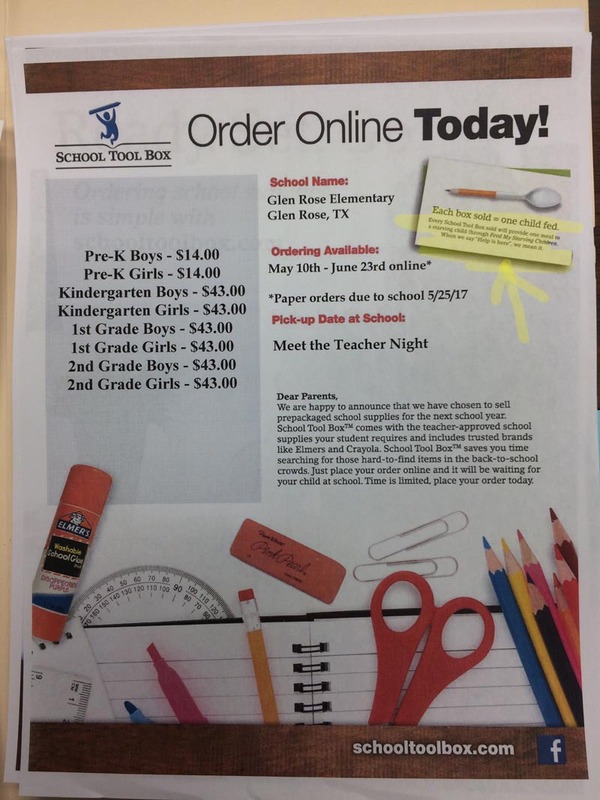 Here is the flyer that went out for "Meet the Teacher" night that shows that "Each Box Sold=One Child Fed" . No place on this flyer does it indicate this is from the PTO but from the school. 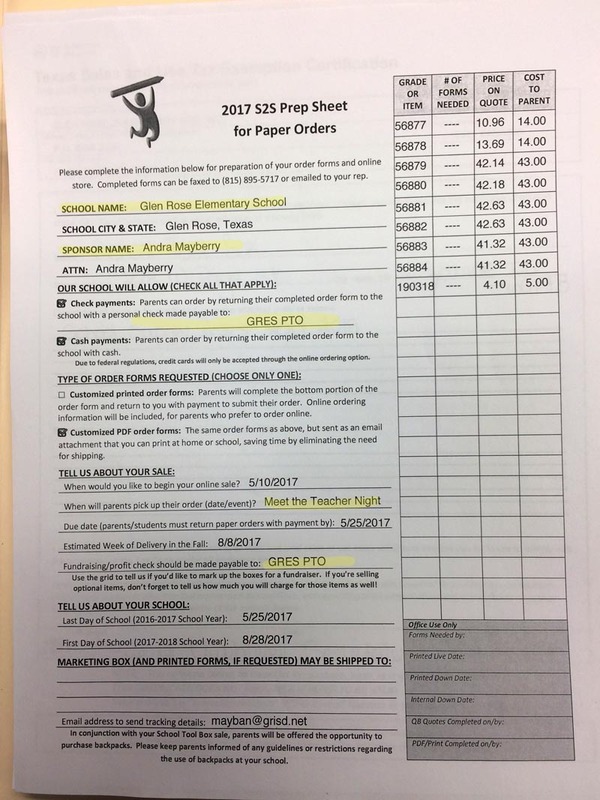 The order form does say to make out the checks to Glen Rose PTO. Why wasn't that on the flyer? And why was the school orchestrating all this instead of PTO? 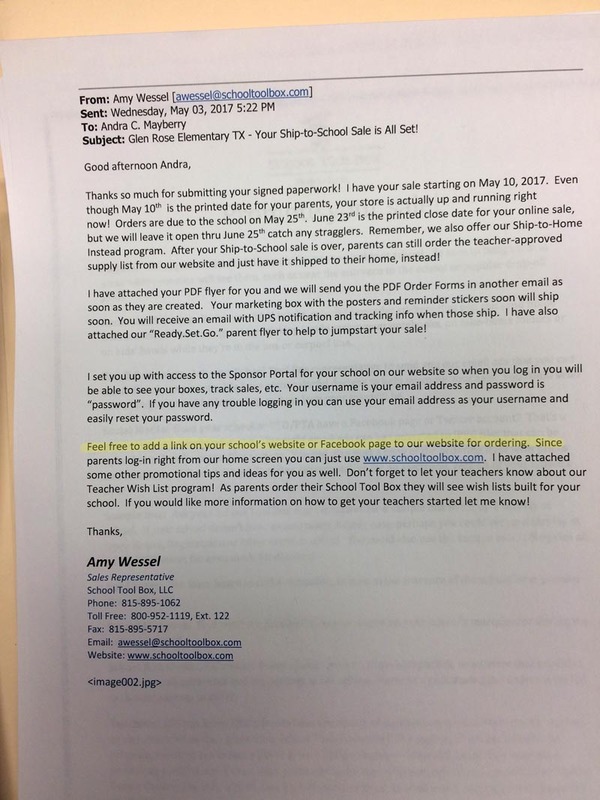 On May 12, the rep said that the PTO president could ask to be listed as a sponsor, showing this was not done at least up to that point. 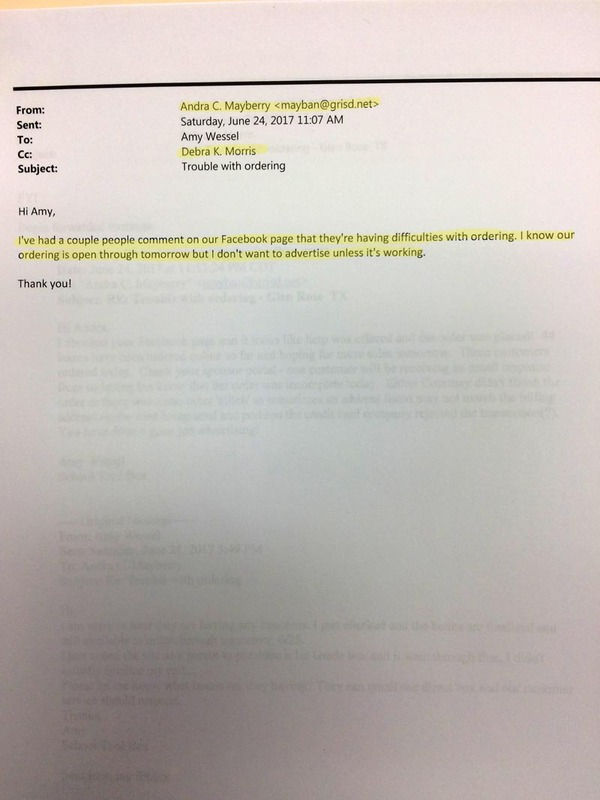 Note in this copy of the email that principal Debra K Morris is CC'd, so she is aware of this whole process and that the official FB page is being used for advertising and sales. 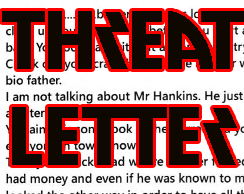 Another couple of emails in the request I got included two emails from my husband, Paul Harper, who had noticed that the FB page was being used for advertising in the first place. 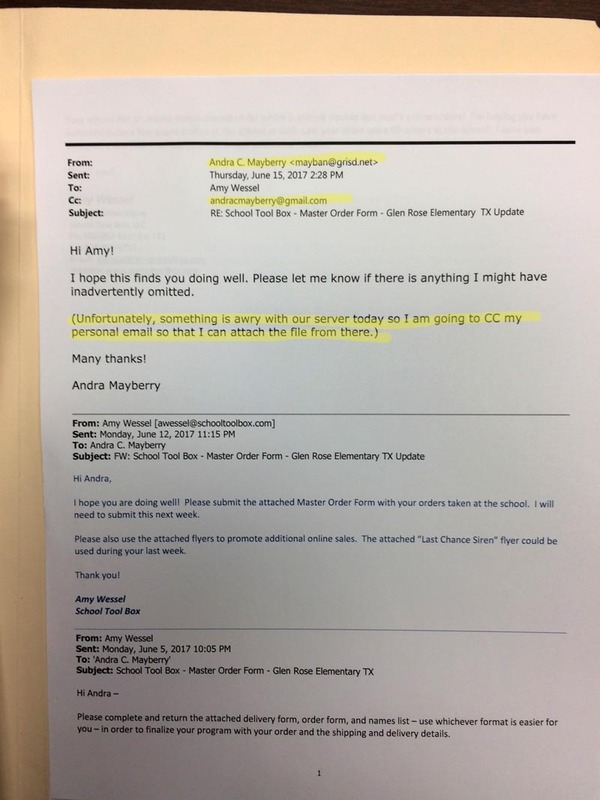 Note that both Wayne Rotan and Debra Morris are included in the email chain. 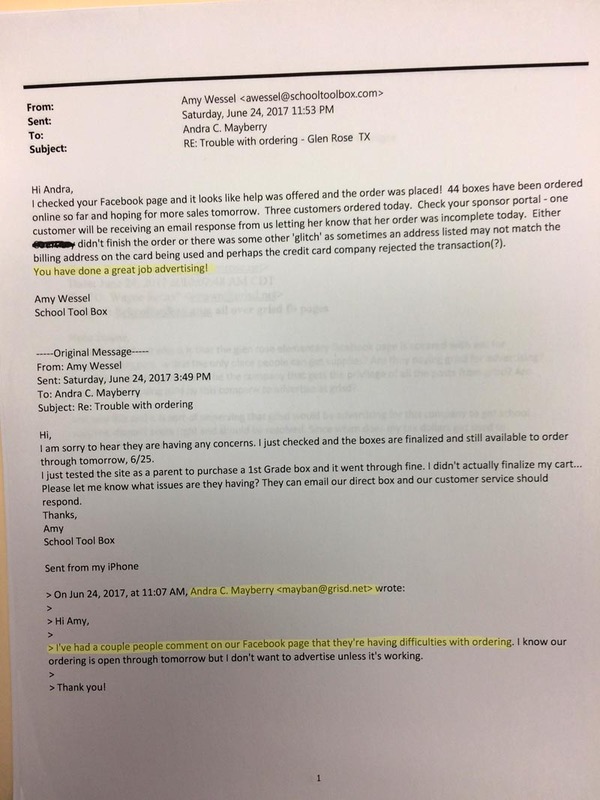 On June 12, 2017 Andra was sent flyers to use on the FB page. She did use them. 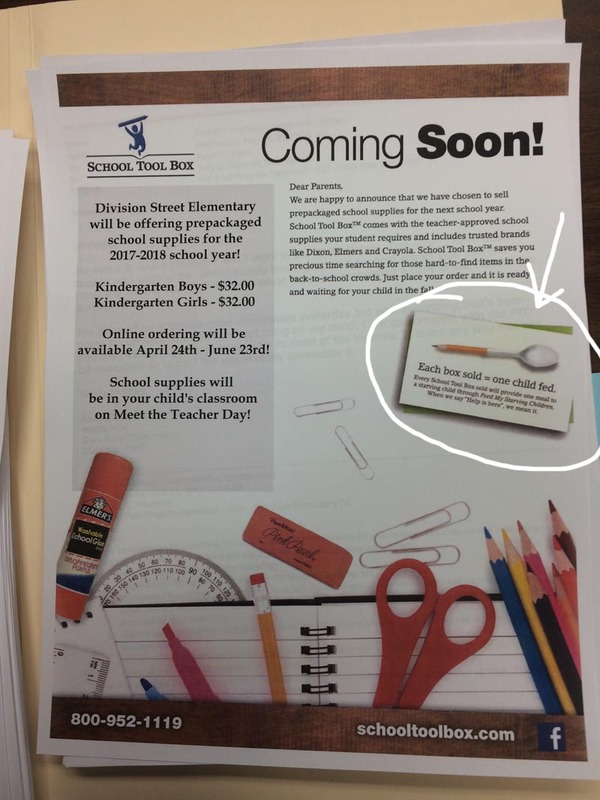 Notice that these flyers say nothing about Feed the Starving Children. Now, on the PTO. 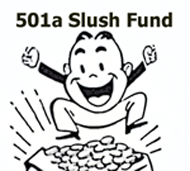 I looked on the SOS website, especially since there is a tax exempt certificate associated with this, to see just who IS in the PTO. Turns out that this was registered in 2007 and has never been updated. One of the people listed there said she had had nothing to do with it in years. I frankly do not understand why the PTO is using GRISD's address. 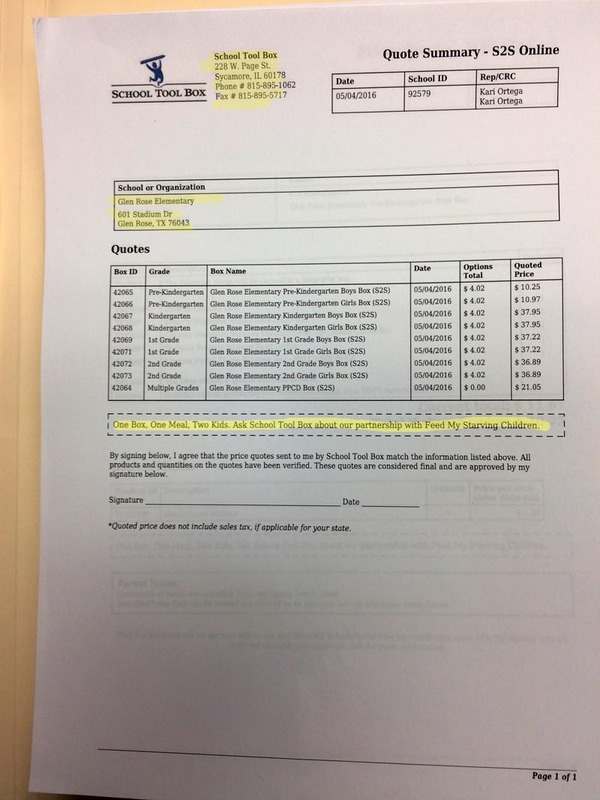 If GRISD is somehow responsible for the PTO, then why aren't they making sure the PTO is up to date and has proper papers filed?